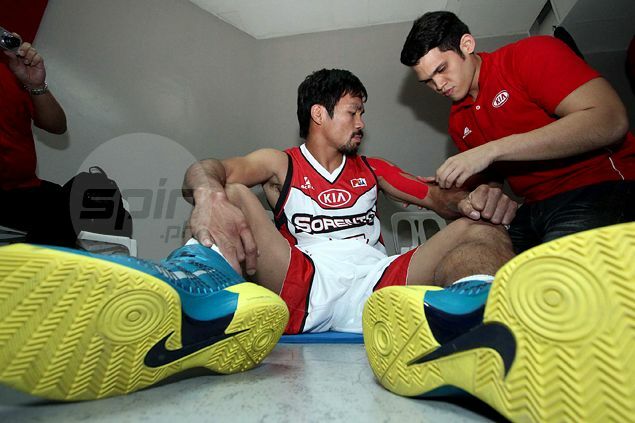 MANNY Pacquiao is set to make his PBA comeback on Wednesday. Three days later, he is set for his All-Star debut. Mahindra officials said on Tuesday the team's playing-coach will be playing in the Blitz game pitting the Greats against the Stalwarts when the PBA All-Star Weekend begins on Friday at the Smart Araneta Coliseum. Pacquiao, a team official said, will be taking the place of Mahindra guard LA Revilla in the Blitz game that features a mix of league greats like Alvin Patrimonio, Johnny Abbarientos and Noli Locsin, rising stars like Ian Sangalang, Chris Banchero and Kevin Alas, and D-League standouts Mac Belo and Roger Pogoy. The eight-division world champion had also taken the place of Revilla in the Mahindra active roster after the former La Salle star broke his nose in practice on Monday, keeping him out of the Enforcers' game against Alaska on Wednesday and the Blitz game two days later. On the other hand, Mahindra youngster Paolo Taha will take Revilla's place in the Obstacle Challenge, team officials said. Also seeing action in the exhibition game are Maverick Ahanmisi, Anthony and David Semerad, Raymond Almazan, Ed Daquioag, Cris Tolomia, Russel Escoto, Raffy Banal, Jonathan Grey, Bryan Cruz, Bong Ravena, Nick Belasco, Ronnie Magsanoc, Paolo Bugia, and Topex Robinson.